Certain therapies that have proven effective in treating some types of breast cancers are ineffective for women diagnosed with triple negative breast cancer (TNBC). In fact, there is limited targeted drug therapy for this type of breast cancer, a rare type diagnosed in only 20 percent of breast cancer patients. Repurposing FDA-approved drugs for new patient groups is one of Zhang’s passions, and what he looks toward when designing his mechanistic studies of how cancer cells live and die. Not only is it faster to implement the use of a repurposed drug—because developing new drugs and receiving FDA approval for their use can take years— but “for repurposed drugs, we already have a safety profile out there, and know how they work in certain tissue context,” Zhang said. 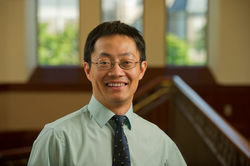 A journal article about the discovery upon which the grant was based is under review, and is expected to be published in 2019, according to Zhang.